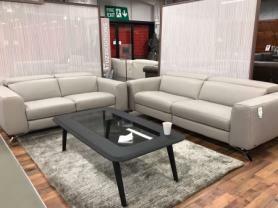 Bolzano beautiful grey leather corner sofa with power recliner on each end. The leather is beautiful grey protecta family and pet friendly leather. High back and pocket sprung seating make it most comfortable. Spacious seating for all the family. Comes a matching power recliner chair. Approximate Measurements: Corner: 249 cm x 187 cm. Chair: 103 cm. Depth: 100 cm.